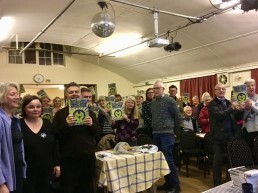 Over 130 people packed Shoreham Village Hall to hear a rousing speech by Dominic Dyer from The Badger Trust. Dominic Dyer handed out copies of Chris Packham’s Peoples Manifesto for Wildlife. The photo shown was sent to Chris Packham to illustrate our support. The wonderful Hop Pickers musical group helped to make the evening very special. Caterer, Agneta Edwards, provided some delicious vegan food and there were many badger bargains snapped up on the Bring and Buy Stall. The evening increased our resolve to do all we can to protect our precious Kent badgers. Thank you to all who attended and especially to those who have joined the group. Anyone who would like to become a member can find the application form on this website. The photo above was taken to send to Chris Packham to assure him that he has many supporters in West Kent. West Kent Badger Group Annual General Meeting 2019 is on Saturday, 27th April at 2pm. The venue is Sevenoaks Wildlife Reserve (Bradbourne Vale Road TN13 3DH). Everyone is welcome. Our speaker is Luke Steele from The League Against Cruel Sports. Refreshments will be served and there will be a fund raising raffle plus our usual badger gift stall. During the afternoon, there will be an opportunity to walk around the reserve. 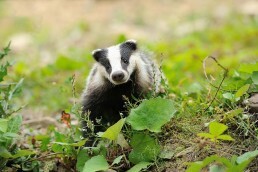 Training sessions for volunteers interested in rescuing badgers. Trainer, Dave Witherspoon, led the training session on 24th March when 7 participants were provided with detailed information about the life of the badger and what is involved in rescues. Dave used his purpose built training room plus an ‘on site’ visit to a local sett as the venues for the morning. 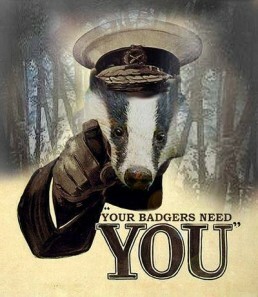 The WKBG is hoping to create a list of volunteers who will be able to assist with the large numbers of requests we have over a year for assistance with injured badgers and where a badger has been run over and killed, help with searching for cubs.